The Lord Jesus will appear again in glory and reign eternally in glory. We will be glorified with Him to participate in the manifestation of His kingdom in the coming age and in New Jerusalem. Here, as in Romans 8, sufferings and glorification are coupled. Paul calls our sufferings a “momentary lightness of affliction.” The affliction is light compared to the eternal weight of glory. And it is “momentary” because Paul is regarding unseen, eternal things (v. 4:18). These “eternal things” all consummate in New Jerusalem. But how do we “regard/look at/fix our eyes/focus on*” eternal things? First, “faith is the substantiation…of things not seen” (Heb. 11:1). We have “a spirit of faith.” We learn to exercise our spirit and thereby experience Christ as our faith‡. Second, we love the Lord. “Jesus Christ; whom having not seen, you love” (1 Peter 1:7b-8a). For this, try declaring Lord Jesus, I love You. And pray, Lord Jesus, increase my love to You. Exercising our faith and love toward the Lord brings us into the foretaste of New Jerusalem now. * Various translations in 2 Cor. 4:18, thanks to Bible Hub. 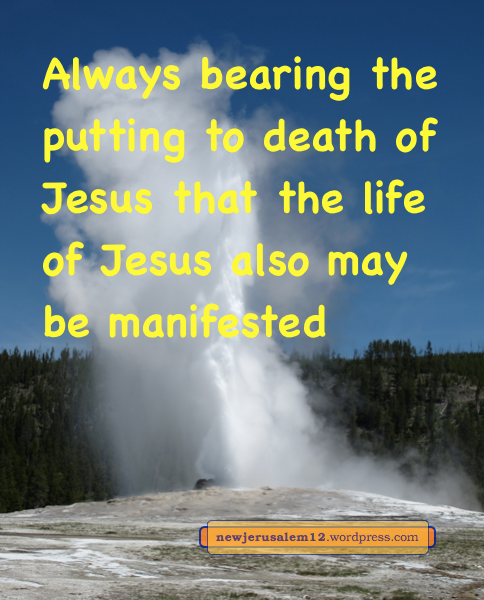 ‡ See Key to Experiencing Christ–the Human Spirit, The. The Lord Jesus asks us to deny ourself, take up our cross daily, and lose our soul life. This is our path to New Jerusalem but it seems quite negative. But remember, the Lord’s death is followed by resurrection. The Lord’s death applied in us is followed by His resurrection applied in us. New Jerusalem is a city of resurrection, not a city of our natural life. Our natural life must be denied so that resurrection life can spring forth. When the Lord returns, we will experience the redemption of our mortal body. Until then we bear, not an ordinary death, but “the putting to death of Jesus” that the resurrection life may be manifested. This manifestation will continue eternally in New Jerusalem. Verse 12 says that death operates in us. This is our experience of the cross. Verses 13-14 say we have a spirit of faith, “knowing that He who raised the Lord Jesus will raise us also with Jesus.” This coming experience of resurrection brings us into the manifestation of the kingdom and then to New Jerusalem. Photo by David Goodrich, courtesy of U.S. National Oceanic and Atmospheric Administration. In New Jerusalem we will see the face of God and the Lamb with no obscuration and will be fully in His glory. But we must not forget that the Lord’s prayer for this is already being answered. Second Corinthians 4 speaks about the proclamation of the gospel now. When we preach Christ Jesus as Lord and not ourselves (v. 5), “the God who said, Out of darkness light shall shine, is the One who shined in our hearts to illuminate the knowledge of the glory of God in the face of Jesus Christ” (v. 6). God has already shined into the heart of everyone who believes. 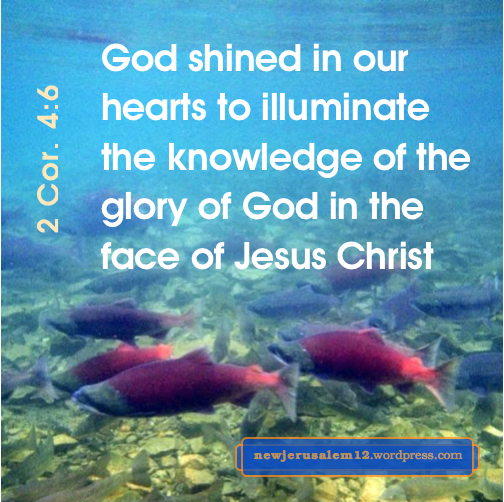 This shining brings us the knowledge, the spiritual realization, of the glory of God. And this glory is in the face of Jesus Christ. This is an experience of New Jerusalem today. We in ourselves are merely earthen vessels, but we have this excellent treasure in us (v. 7). Inwardly we have the treasure and outwardly our Christian life may have troubles (v. 8-12). Our outer man is decaying (v. 16), but despite the troubles, this treasure is renewing our inner man (v. 16) to match the newness of New Jerusalem. With the heavenly view (v. 18), we can declare with Paul, “our momentary lightness of affliction works out for us, more and more surpassingly, an eternal weight of glory” (v. 17). 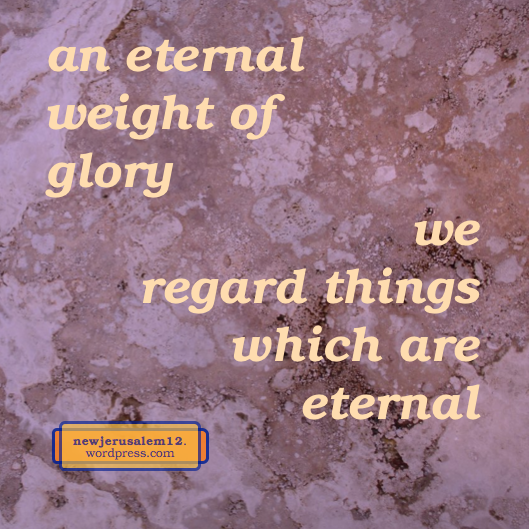 This eternal weight of glory is our participation in New Jerusalem. To continue seeing the glory in the face of Jesus Christ and to cooperate with the renewing process through which we are passing, we exercise our spirit of faith to speak (v. 13). This speaking is based on our bold confidence in the resurrecting God (v. 14), whose work in us culminates in New Jerusalem. Photo courtesy of U.S. National Park Service. First Timothy 3:15 tells us “the house of God is the church of the living God.” This house is being enlarged to be the city of God, New Jerusalem. The believers in Jesus Christ are the house of God. In eternity all God’s people will be His city, New Jerusalem. 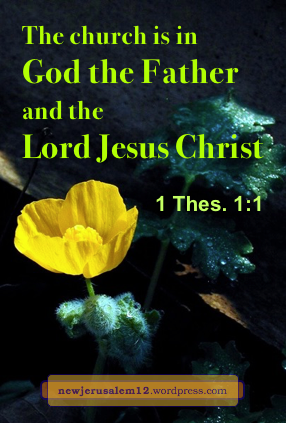 Today the church, the house of the living God, is in the Lord Jesus Christ and in God our Father. This is the fact in the Bible. It is not confirmable with our physical senses but it is substantiated by faith and experienced in spirit. The church is being enlarged to become the city of the living God, New Jerusalem. Like the church today, New Jerusalem in eternity will not be physical. It will be a living composition of all God’s people and it will be in God our Father and in the Lord Jesus Christ. As grace and peace are to the church in 1 Thessalonians 1:1, grace and peace will flow even more in New Jerusalem. What a wonderful living city this is! God’s economy is God’s household administration, God’s working out of His plan. In this economy we receive grace. This grace gradually develops our spiritual vision, enabling us to realize God’s mystery all the way to New Jerusalem. This is Ephesians 1:7-12 and 3:8-11. 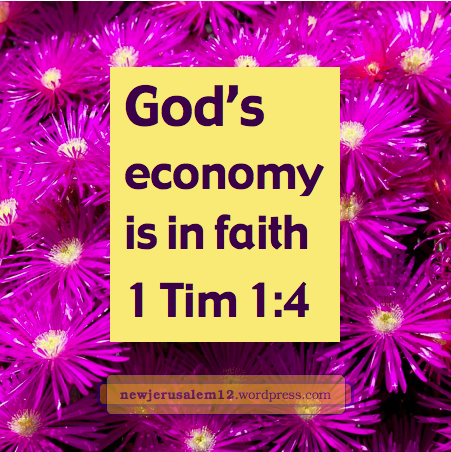 First Timothy 1:4 tells us that God’s economy is in faith. It is neither physical nor psychological but in the spiritual realm of faith. Hebrews 11:1 tells us that our faith makes the unseen things (including New Jerusalem) real to us. 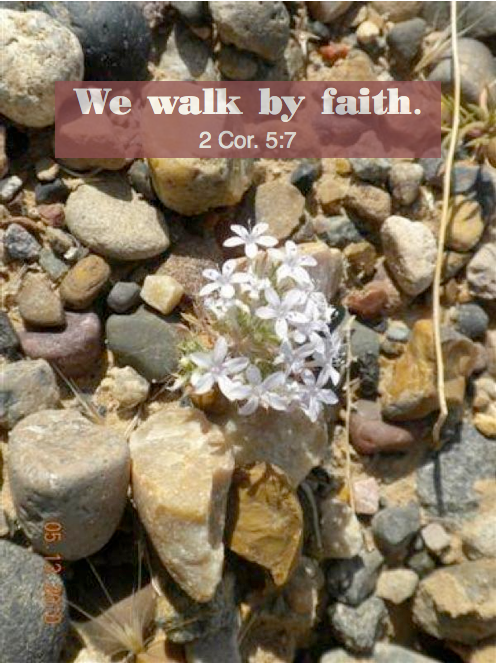 We have a “spirit of faith” (2 Cor. 4:13) with which we speak the things of Christ Jesus, things which produce God’s economy (1 Tim. 1:3-4). This is what Paul did in announcing the unsearchable riches of Christ. The announcing of the riches of Christ builds up His Body. This announcing is the outflow from Christ the Head, through all the members, which “causes the growth of the Body unto the building up of itself in love” (Eph. 4:16). Ultimately these unsearchable riches produce New Jerusalem and are displayed by New Jerusalem. The apostle John declares “I saw a new heaven and a new earth….And I saw the holy city, New Jerusalem…prepared as a bride adorned for her husband” (Revelation 21:1-2). This post concludes a lengthy series on the preparation of the bride. God’s side—God “has prepared a city” for His people of faith who turn their back on the fallen world and “long after a better country, that is, a heavenly one” (Hebrews 11:16). Our side—we must cooperate with God’s operation to get ready. “Let us rejoice and exult, and let us give the glory to Him, for the marriage of the Lamb has come, and His wife has made herself ready” (Revelation 19:7). Here is a summary statement, a key Bible verse, and a link to each post in this series on the preparation of the bride of the Lamb. Some posts also link to a coordinating song. ✦ The first step in the preparation was God’s sending of John the Baptist to “prepare the way of the Lord” as prophesied in Isaiah 40:3-4 and quoted in Matthew, Mark, and Luke. ✦ To prepare the way is by exhorting people to repent, to have a change of heart (Matthew 3:3). This is followed by many other words in Matthew concerning our heart. ✦ Jesus was declared to be God’s salvation, “prepared before the face of all the peoples” (Luke 2:30-32). Without Him as our salvation, we cannot come to New Jerusalem. ✦ In Hebrews 10:5-10 we see the preparation of a human body for the Lord Jesus, that He could be the unique sacrifice for sins, a step in God’s preparation of New Jerusalem. ✦ In John 14:2-3 the Lord Jesus tells us, “I go to prepare a place for you. And if I go and prepare a place for you, I am coming again.” He went through His death and came again in resurrection. ✦ Romans 9:23 calls us vessels of mercy, saying that God “might make known the riches of His glory upon vessels of mercy, which He had before prepared unto glory.” New Jerusalem will be the consummation of this glory. ✦ In 1 Corinthians 2:9 are “things which God has prepared for those who love Him.” Verses 6-14 show that these things have spiritual characteristics related to New Jerusalem. ✦ In Matthew 24:32-44 the Lord Jesus warns us about His coming, “be ready, because at an hour when you do not expect it, the Son of Man is coming.” He also said, “My words shall by no means pass away.” His words are important for our getting ready. ✦ In Matthew 25:1-13, “those who were ready went in.” This is to be with Jesus Christ our Bridegroom. For this we need the extra supply of oil. ✦ We should get ready and by ourselves we cannot. But “the word of God is living and operative” (Hebrews 4:12). We receive this word by faith (4:2) to get ready for the Lord. ✦ Our receiving the living word of God by faith is our cooperation with the Lord. We also “pursue…with those who call on the Lord out of a pure heart” (2 Timothy 2:22). ✦ To call on the Lord out of a pure heart is needed, but in ourselves we are not pure. Nevertheless, we can “be perfect as our heavenly Father is perfect” (Matthew 5:48). He is our Father and we have His perfect and pure life. ✦ The “things which God has prepared for those who love Him” are “Things which eye has not seen and ear has not heard and which have not come up in man’s heart” (1 Cor. 2:9). ✦ God prepared the city New Jerusalem (Hebrews 11:16), the city is the bride (Revelation 21:2), the bride made herself ready (Revelation 19:7). Did God do the preparation or do we get ourselves ready? ✦ God operates and we cooperate. We are those engaged to Christ, to become New Jerusalem as the bride of Christ, and we should maintain our simplicity and purity toward Christ (2 Corinthians 11:2-3). More about God operates and we cooperate. ✦ God has prepared the city but we do not see it. Why? God is eternal but we are stuck in time. So, we turn our hearts to the Lord (2 Corinthians 3:16-18) and exercise our spirit of faith to care for the unseen, eternal things (2 Corinthians 4:13, 18). ✦ God has prepared the city and we have come forward by faith. We continue to pursue, to stretch forward to what God will manifest (Philippians 3:12-14). ✦ We pursue toward the goal and “we are not of those who shrink back” (Hebrews 10:39). What are we pursuing? Christ Jesus. We pursue that we “may gain Christ” (Phil. 3:8). ✦ God prepared and we are pursuing to gain Christ and be found in Him. Yet, there are tribulations while we strive to enter into what God has prepared. Nevertheless, Hebrews 9:15 assures us that we will receive the promise of the eternal inheritance. ✦ God has prepared New Jerusalem. We do not see the city with our eyes but “faith is the substantiation of things hoped for, the conviction of things not seen” (Hebrews 11:1). ✦ New Jerusalem is the bride of the Lamb, Jesus Christ. Revelation 19:7 proclaims, “Let us rejoice and exult, and let us give the glory to Him, for the marriage of the Lamb has come, and His wife has made herself ready.” Love is the critical factor for a bride’s preparation. ✦ Love is the critical factor and Ephesians 5:2 encourages us to “walk in love, even as Christ also loved us and gave Himself up for us.” To walk in love is to have our daily life governed by and filled with love from the Lord to us and reflected from us to Him. ✦ New Jerusalem is the consummation of all the things God has prepared for His lovers. The crucial factor in our preparation is that our hearts be filled with love for our Lord. Lord Jesus, we love You! God has prepared a city for the people of faith! But … we do not yet see New Jerusalem because God is eternal, outside of time, and we are still partially in time and in the old creation. • Hebrews 2:8-9 says “in subjecting all things to Him [Christ], He [God] left nothing unsubject to Him. But now we do not yet see all things subjected to Him, but we see Jesus…” To see Him we must look away from everything else to Him (Hebrews 12:1-2). The important point is not to depend on our physical senses for spiritual matters. Hebrews 11 is about people of faith, not about those with keen physical eyesight. God has prepared the city. Our responsibility is to look away unto Jesus; to regard the unseen, eternal things; and to seek the city to come, New Jerusalem. 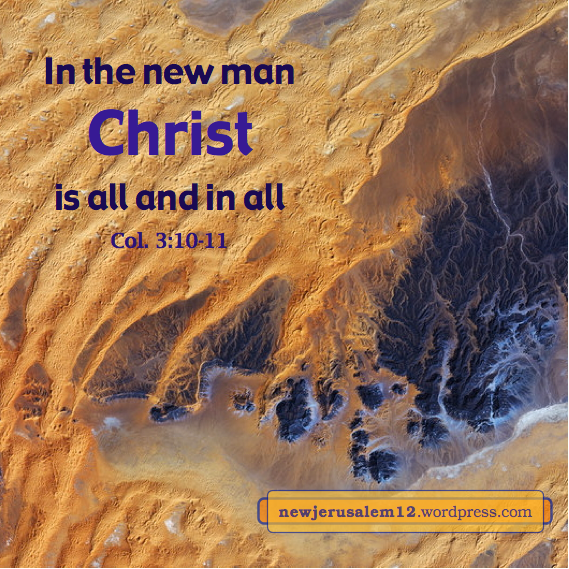 For Christ to be all and in all we must first be put (by God) into the new man. Then we must go through a process of renewing—“the new man, which is being renewed” (Colossians 3:10). In Romans 12:1-2 we present our bodies as a living sacrifice to God, love Him to be saved from loving the world/being conformed to this age, and thus are transformed by the renewing of our mind. In 2 Corinthians 4:13-18 we exercise our spirit of faith; speak the things of Christ which we have been assured of in His resurrection; and concentrate our attention on the eternal, unseen things. In such a living our inner man is being renewed day by day. In Ephesians 4 we take Christ as our lowliness and meekness that we may be diligent to keep the oneness of the Spirit, we put off our former manner of life, and we speak not with corrupt words but with grace-giving words so as not to grieve the Holy Spirit. The result is that we are renewed in the spirit of our mind. In Christ we are a new creation and in Him we are in the new man. This is positional. The outcome of the Spirit’s renewing is that our condition, our constitution, our living, and our behavior gradually is transformed to match the new man. This is our path to New Jerusalem. Bible verses quoted in these posts are from The Holy Bible, Recovery Version, published and © by Living Stream Ministry, Anaheim CA, 2003. The New Testament of this Bible, with its outlines, footnotes, and cross-references, may be viewed at online.recoveryversion.org; this too is © by Living Stream Ministry. Photo of Sahara desert by JAXA, courtesy of ESA.